Rugged cast iron housing resists shock loads and maintains accurate gear alignment. High efficiency helical/spiral bevel gearing per AGMA/ASME standards. Gearing is hobbed, case hardened, and profile ground. Oversized high capacity alloy steel output shaft which provides stiffness to accommodate high bending loads. Heavy-duty output shaft bearings designed to carry radial and axial loads generated by mixing impellers. Output shaft bearing lives in excess of 100,000 hours. Dry-Sump on output shaft which provides safety against oil leakage. 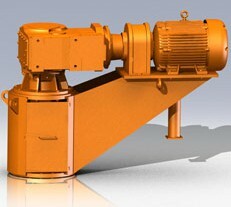 Designed to allow use of NEMA or IEC motors. Double and Triple reduction available.